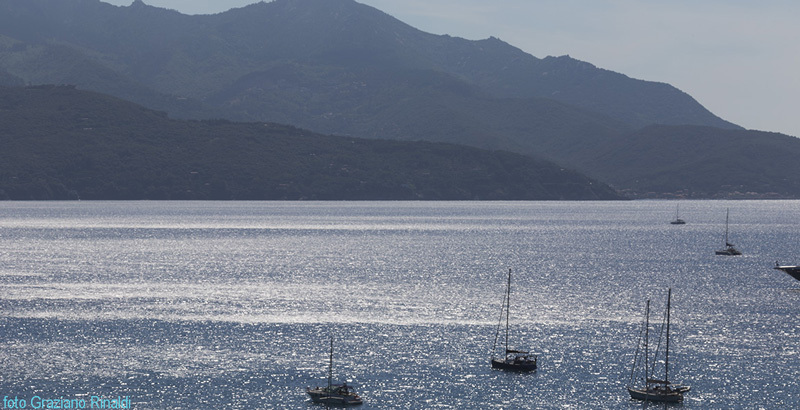 In summer, the spectacular Gulf of Viticcio lying within the jurisdiction of Portoferraio is occupied by an unlikely crowd of boats ranging from small sailing boats, to some Russian billionaire’s yacht or a resident’s rustic boat ,but for everyone of these, it’s a magnificent attraction. The wonderful sheltered bay is closed to the west by the beautiful summit of Mount Capanne and surrounded by cliffs ,verdant forests and pine forests; and when the sun goes down you can see the silhouette of the Island of Capraia. Despite the transformation of this beautiful bay on the island of Elba into an improvised natural marina, very often I go swimming there. There are days, especially during the summer weekends, when the smaller boats sail only a few metres from the coast and you should be careful when you swim. Anyway, this unnatural crowding, in my view doesn’t affect the beauty of the place or its usability, as the environmental context with its beauty dominates any human artifice, and so the latest floating folly of Sheikh So and So blends in easily. Within little more than a kilometre, the Gulf of Viticcio, apart from the sailing craft that we talked about, also offers the opportunity to swim on and around at least three different small beaches. Starting from the west it isn’t the first few feet of fine gravel closed around the microscopic village which gives its name to the Gulf on the Island of Elba it is the few buildings including a hotel and a restaurant. The name of this postage stamp of beach is just Viticcio. The beach, which I thought was the “authentic” one, is located about 100 metres from the first, and is accessed by a short and narrow unpaved street in front of Hotel Viticcio, after about 70-80 meters, you go down through thick and gnarled pine trees, until you can see a small creek entirely covered by a tall stack of dried leaves of posidonia. The end of the beach on the opposite side of the steps, is also the start of private access to the sea. 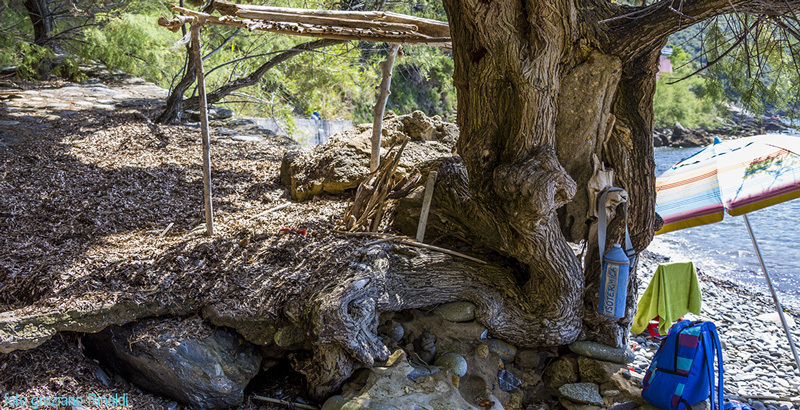 In the past there were tamarind trees planted there, just about the only trees that can survive so close to the sea, over the years one of these resistant plants has joined itself to the rustic stone wall and today offers a welcome shady spote right in front of the sea. The rest is in full sun, but only in the afternoon, because in the morning this beach remains almost completely in shade. The only time when our esplanade of dry leaves becomes a pleasant beach and aesthetically acceptable, is when the wind blows Scirocco. Then the pine trees stand out against the backdrop of the turquoise sea and the beautiful cliffs of fine sandstone loom over the stunning clarity of the water. I’m not trying to badly publicise a beach on the island of Elba, but I must say that among other things that affect the popularity of this little beach which is also called “Viticcio”, is the difficulty of entering the water, this is because of the large round boulders you find just as you step into the sea. However, if you have the good fortune to be there on the right day when there is the sunny Scirocco (because often the Scirocco is accompanied by lighter clouds), then the bay isn’t overcrowded with boats, and with a spot in the shade of the tamarind trees, you could be overwhelmed enough to write a post like this. If you have the energy for a few laps in the sea, then in 5 minutes you can reach the third beach with the name “Viticcio”. The latter is of a different nature from the other two and above all is partly privatized by the two hotels just above. Getting to the path is rather complicated, not because it is difficult, but because access has been closed for some time for a small repair to the steps leading down to the beach. Of the three, this is the only one with a sandy beach, the provided umbrellas and chairs are only for customers of the two hotels.It seems strange, but personally I prefer the middle one, the one with the pine trees and the expanse of dry leaves, because the strongest motivation for going there is to swim along the reef, right and left, a route of about a mile in either direction , right down to the promontory of Enfola on the left, in the direction of Punta Peninsula. 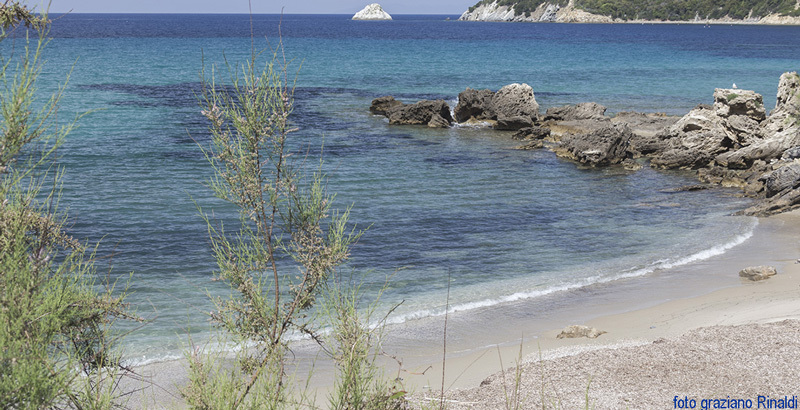 Let’s face it, these three beaches on Elba are not great examples of beauty, but are mostly starting points for those who want to explore the beautiful sea depths all around. And I also want to go a little further: despite the simplicity of these beaches, I believe that they each deserve a proper name. Moreover, the name “Viticcio” is derived from the secular culture of vineyards, and up to half a century ago this area was full of them, but today almost all have been replaced by woods and pine forests, it is not a priority for the island of Elba , but perhaps it would be appropriate to also change them in the name registry.